The present study has allowed the development of improvements to a number of aspects of the first version of the BGS Nitrate Time Bomb (NTB) model. The model combines the BGS Nitrate Input Function (NIF) and the ADAS NEAP-N model data into an effective NIF. This composite NIF is spatially as well as temporally distributed and allows the model to be run over a wide timescale. It has the unique potential to be projected forwards using agreed nitrate inputs from future programmes of measures to control nitrate. This could provide a powerful predictive tool for policy development. The use of water levels derived from OS river data gives a better unsaturated zone (USZ) thickness, representing the thickness which remains unflushed during annual cycles in the water table. The use of the larger-scale geological mapping (250k) rather than the original 625k allows layered aquifers such as the Coal Measures and Jurassic Limestones to be more adequately represented in the model. The application of a national recharge model has also several advantages. A process-based model of the unsaturated zone recharge has been developed and applied to two areas of the NTB model to demonstrate the improvements it delivers. For principal and secondary aquifers which have good data available in the aquifer properties manuals (Allen et al., 1997; Jones et al., 2000), spatially varying USZ velocity can be better estimated rather than using a fixed value. This is of particular significance for formations where there are no measured USZ velocities. This would also allow the impact of changes in recharge under a range of climate change scenarios to be assessed. The improvement also allows a more realistic treatment of low permeability superficial deposits, portioning the nitrate at the surface between runoff and recharge and providing a vertical velocity in the superficial deposits. In the previous version of the model all nitrate movement in these deposits was set to zero. For less important secondary aquifers and low productivity strata it requires only USZ thickness, USZ velocity and NIF. For principal and important secondary aquifers a process-based approach to USZ velocity also requires modelled recharge and aquifer properties. Where low permeability superficial deposits are present the process-based approach allows the routing of a proportion of the nitrate to runoff and the estimation of a realistic travel time through the deposits. This requires the lithological class and the thickness of the superficial deposits to be included. For borehole and catchment scale applications the NTB model can be linked to a saturated zone model which routes groundwater to river baseflow. The case studies demonstrate that the model can be benchmarked against other nitrate modelling approaches, both for borehole catchment studies which use a similar approach and for basin-scale models which use a different approach. Form a numerical component of an updated NVZ delineation methodology/model and/or provide supporting evidence at the review stage. Model output can readily be combined with other Environment Agency models to demonstrate where a thick USZ may be contributing to inconsistencies between nitrate loading and monitored nitrate in groundwater during NVZ designation. Provide evidence to support the determination and characterisation of pollutant (nitrate) trends in groundwater, starting points for trend reversal and/or justification for establishment of alternative (or less stringent) objectives as part of WFD implementation. Contribute to public water supply and catchment management and protection measures as is already the case. Uses heuristic values for USZ velocity for less well characterised strata where aquifer properties are not available. Does not include variable infiltration in these areas (e.g. for investigating climate change scenarios). Does not account for bypass flow. The model includes a general attenuation factor but in the current version this is set uniformly across the whole modelled area. The model does not yet include either a means of routing this directly to the water table or providing values of proportion of bypass flow to individual formations. Does not currently represent denitrification since we lack reliable data to adequately describe the extent, both spatial and in amount. BGS national mapping of unsaturated zone travel time at 1 km grid scale. Environment Agency groundwater NVZ mapping. Environment Agency ‘Groundwater Lines of Evidence’ NVZ designation risk model at a 1 km grid scale including pressure information, observation data and final risk scores. A GIS approach has been used to identify areas of England where unsaturated zone lags may be significant and where there is uncertainty in the NVZ designation. A national overview of areas of designation uncertainty is initially provided, followed by national and regional scale assessments of where the risk model indicates there are mismatches between monitoring and loading data. This analysis results in suggestions of where the BGS NTB model might be usefully applied/integrated to support a future NVZ designation process. The risk model is fully described in Environment Agency (2012) and summarised in Stuart et al. (2016). It consists of eight components (Table 6.1). Three components describe pressures and are mainly derived from modelled inputs of nitrate data where the higher the pressure, the greater the risk that groundwater nitrate concentrations will exceed 50 mg NO3 l-1. The other five components describe the observed nitrate and draw upon a combination of water quality monitoring data and local Environment Agency evidence. Four of the components were derived using national datasets; nitrate monitoring data were interpolated to produce national maps of current (2010) and future (2027) groundwater nitrate concentration and agricultural and urban nitrate leaching were estimated from land use. The other four components were derived from professional judgement by local area Agency staff. Weightings were designed to give the greatest importance to groundwater monitoring data and secondary importance to agricultural nitrate loss data derived from the NEAP-N model. The model could incorporate the understanding of local Environment Agency hydrogeologists but scores were set using national lines of evidence. Each component was given a score (positive scores increase the overall risk and negative scores decrease the overall risk) and weightings were applied to these scores. The weighted scores were then combined to yield an overall risk score indicating the strength of evidence that the groundwater was polluted by nitrate from agricultural sources. If the risk that groundwater nitrate concentration is exceeding 50 mg NO3 l-1 and agriculture is the source, the score will be higher than 8. This will lead to potential groundwater NVZ designations. A medium score ranges from 8 to 3 and shows that either the monitoring or modelling assessments exceeded or were likely to exceed 50 mg NO3 l-1. These areas are likely to be included in potential designation areas around high risk areas dependent on the hydrogeological setting. A low score is lower than 3 where both the monitoring and modelling assessments show that nitrate concentrations were not likely to exceed 50 mg NO3 l-1. These are generally not considered for designation and any low risk areas that are repeatedly shown to be so may be considered for removal from designation. In the Environment Agency risk model, final risk scores between 3 and 8 indicate there is some degree of uncertainty in the monitoring and/or N loading data and consequently may or may not be designated. In these areas there may be a mismatch between the N loading estimations and observed groundwater nitrate concentrations. This may be the result of time lags in the unsaturated zone and potentially nitrate loss processes such as denitrification. 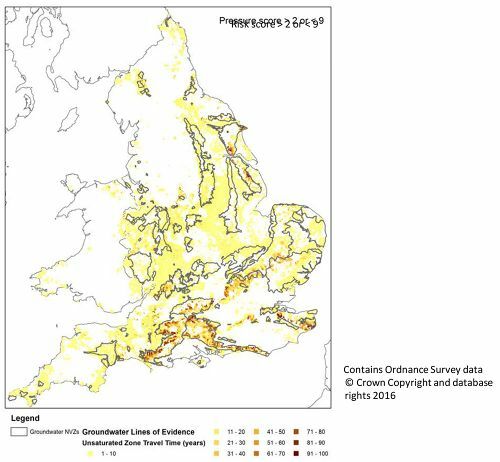 Figure 6.1 shows parts of England designated as groundwater NVZs and the unsaturated zone travel time where final scores are between 3 and 8. It can be observed that large areas of England are overlain by this range of final scores, in particular the chalk outcrop of southern and eastern England. Figure 6.1 Unsaturated zone travel times for areas of England and Wales where final risk score is between 3 and 8 using the 2013 data. Figure 6.2 (a) shows pressure (N loading) scores in the risk model where the final score is between 3 and 8 and Figure 6.2 (c) shows the unsaturated zone travel time where the final score is between 3 and 8 and the pressure score is greater than 3. This is indicative of areas where nitrate loadings are likely to be significant but observed groundwater concentrations are low. If this case occurs where unsaturated zone travel time is long, it is likely that the nitrate loading is yet to have reached the water table. Figure 6.2 (a) Pressure and (b) observation scores for England and Wales where final score is between 3 and 8, (c) unsaturated zone travel times for areas of England and Wales where final risk score is between 3 and 8 and pressure score >3 and (d) final risk score is between 3 and 8 and observation score >4 (all using 2013 data). Pressure scores are highest over East Anglia, Lincolnshire and Yorkshire, with lower scores in the West Midlands and the South West. Travel times where pressure scores are high (Figure 6.2c) are generally short but there are some areas with relatively long travel times in the Chalk of Wessex and southern East Anglia. Figure 6.3 (a and c) shows the same data at a regional scale focussing on the Chalk of Wessex, the South Downs and the Berkshire Downs. Whilst the area of the Chalk where pressure scores are greater than 3 is relatively small, the unsaturated zone thickness is large which results in long travel times (50–70 years). Areas where N loadings are high but observed concentrations are low are highly likely to be the result of time lag in the unsaturated zone. Review of unsaturated zone travel times in such cases is likely to be beneficial during future designations. Figure 6.3 (a) Pressure and (b) observation scores for Wessex, South Downs and Berkshire Downs where final score is between 3 and 8, (c) unsaturated zone travel times where final risk score is between 3 and 8 and pressure score >3 and (d) final risk score is between 3 and 8 and observation score >4 (all using 2013 data). Figure 6.2 (b) shows observation (groundwater nitrate concentration) scores in the risk model where the final score is between 3 and 8 and Figure 6.2 (d) shows the unsaturated zone travel time where the final score is between 3 and 8 and the observation score is greater than 4. These areas are indicative of where groundwater monitoring shows high nitrate concentrations, but N loading data suggests there is a limited current N input to groundwater. It is plausible that this score represents areas where current groundwater nitrate concentrations are a result of historic nitrate loadings. Observed scores are highest over parts of East Anglia, the West Midlands and the Chalk of southern England. At the regional scale in Southern England (Figure (b and d)), areas with high observation scores are often situated in interfluve areas, with long travel times of up to 80 to 90 years. In these areas a review of the unsaturated zone travel time during the NVZ designation process may be of benefit in order to identify those areas with particularly long travel times where current observed concentrations are a result of legacy inputs. Short unsaturated zone travel times. May be designated as NVZs. If unsaturated travel times are short and there is a mismatch between nitrate loading and observed concentrations, this suggests some other loss or attenuation process such as denitrification may be occurring. Consequently, Figure 6.4 can be considered to be a simplistic first estimation of a nitrate loss/denitrification map. 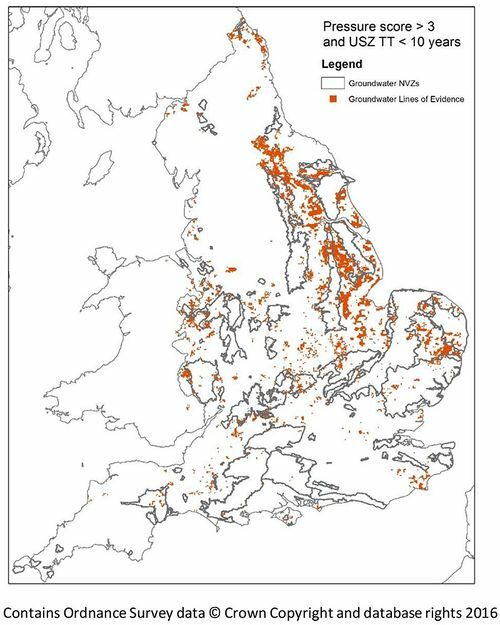 The spatial distribution of areas where N loss may be occurring generally agree with the conceptual understanding of UK hydrogeology. There are large areas of East Anglia where nitrate loss may be occurring where till layers are present which may result in anoxic conditions and denitrification. There is very little potential for nitrate loss across the chalk outcrop which reflects the oxic conditions of the unsaturated and saturated zones. It must be noted that this distribution is an approximate first estimation of potential nitrate loss and requires further investigation through comparison with other indicators of denitrification (redox conditions, organic content). Figure 6.4 Areas of England and Wales where the final risk score is between 3 and 8, pressure score >3 and unsaturated zone travel times are less than 10 years using 2013 data. The examples above illustrate how estimates of the unsaturated zone travel time may be beneficial when designating NVZs and help in understanding and resolving the uncertainties where the final risk score is >2 and <9. For example travel time estimates may help resolve mismatches between groundwater monitoring and N input (loading) datasets. It is recommended that unsaturated zone travel times be incorporated in the risk model. The groundwater risk model already takes into consideration a number of additional factors such as potential denitrification, groundwater-surface water interactions and representative monitoring points. However, these in general rely on expert testimony and so lack some transparency and numerical basis. Consequently, unsaturated zone lag could be used as an additional factor depending on the travel time. The WFD requires establishment of a series of environmental objectives for groundwater. These include preventing or limiting inputs of pollutants, achieving good status and reversing upward trends in pollutant concentrations. Nitrate is the most widespread groundwater pollutant and as a result makes the greatest contribution to groundwater body status failures and upward trends. The difficulty in achieving good status by 2015 and reversing trends was recognised in the 2009 River Basin Management Plans by the setting of alternative objectives which provided time extensions (up to 2027) for the majority of the groundwater bodies impacted by nitrate. However the supporting evidence that can be deployed in support of this approach has so far been limited. The improved BGS NTB model has the potential to provide more robust evidence to support the continued establishment of alternative objectives and where less stringent objectives may be necessary. The model and the case studies have shown that future projections of nitrate trends are possible (at points and across geographic areas, e.g. groundwater bodies) to determine if and/or when threshold values are likely to be exceeded or when trends reversed. Further the model can be used to evaluate the impact of measures (under different) scenarios as part of options appraisal and consider the longer term impacts of climate change. The application of a single consistent model to both NVZ and WFD can also ensure consistency and inter-comparability. The model improvements also mean that it can be applied to other pollutants which are of concern under the WFD. A project workshop was held on the 27th April 2015 with the aim of identifying the approaches to groundwater nitrate modelling across the Environment Agency and linkages with others working in related activities. This was attended by representatives from the Environment Agency, Defra and the NFU. Water utilities were invited but were not able to attend. Project aims, timeline, workshop aims. The nitrate legacy — Nitrate in the unsaturated zone and the NTB model. NVZ briefing material — NVZ storyline, relationship with WFD. Case studies — Thames basin, South Downs site, Delamare. BGS NTB model development — Nitrate input, water levels, geological scale, process modelling, low permeability superficial deposits, saturated zone. It is not possible to validate the NTB approach by using current porewater profile data from the unsaturated zone. There are very little current data and the few recently drilled boreholes are likely to have been targeted at problem areas, rather than typical areas similar to those studies in the 1970s and 1980s during the original nitrate work. Care is needed when comparing NTB model output with NVZ designation datasets where the point data have been kriged to give areal coverage as these have no hydrogeological basis. It was considered that nitrate in groundwater issues identified as part of the WFD process need to be reflected in work carried out for NVZs. There is a perceived discrepancy between the results of work carried out by the Environment Agency for WFD status changes and that for NVZ model predictions. In the UK, the recommended WFD threshold (TV) has been set at 37.5 mg NO3 l-1 by UKTAG (UKTAG, 2012 whereas 42 mg NO3 l-1 is used for NVZs. Exceedance of the TV may contribute to failure of one or more environmental objective. The use of the NTB model has the potential to better understand when, under the different regimes, future failures may occur (if there is an upward trend) or when achievement of these objectives may be realised if trends are reversed. It will also be important how to examine the implications of the differences between the regimes (economic, regulatory failure etc.) in the future and under different scenarios. The NTB model could be useful in assessing and setting recovery times under the WFD. Trend reversal will be reviewed by UKTAG following publication of the most recent WFD plans. An evidence base for trend reversal is required. Denmark successfully challenged on trend reversal and used residence time indicators as an evidence base to demonstrate long travel times. The NTB approach could provide an alternative to this. The NTB approach should provide a useful evidence base to the agricultural community. 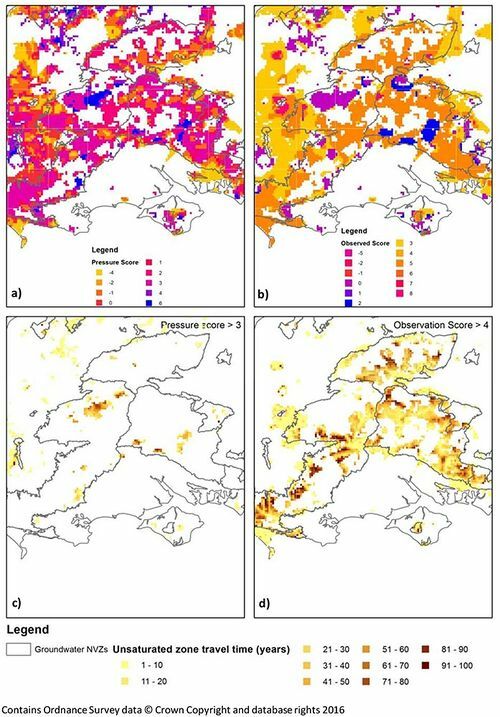 Farmers in West England have been most affected by NVZ designations, but the NTB model shows that long groundwater residence times are more of an issue in the East of England. This may reflect the different balance of surface water to groundwater in these areas and the presence of low permeability superficial deposits. The demonstration of groundwater travel time should be valuable in discussions with the EU Commission. ↑ ALLEN, D J, BREWERTON, L J, COLEBY, L M, GIBBS, B R, LEWIS, M A, MACDONALD, A M, WAGSTAFF, S J, and WILLIAMS, A T. 1997. 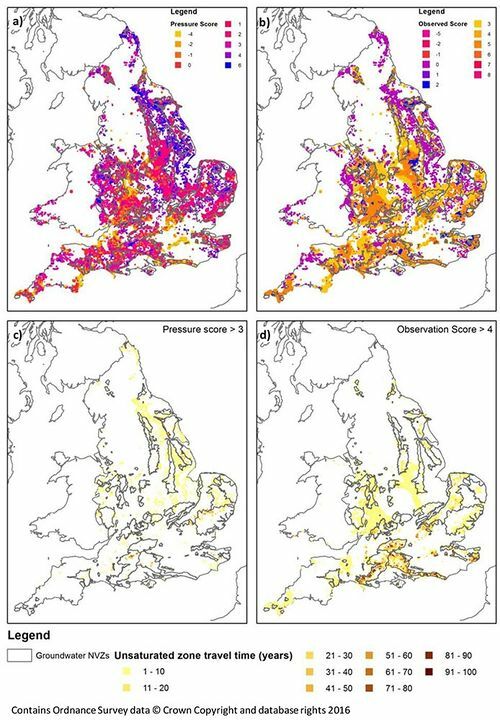 The physical properties of major aquifers in England and Wales. British Geological Survey Technical Report WD/97/34, Environment Agency R&D Publication 8. British Geological Survey Technical Report WD/97/34, Environment Agency R&D Publication 8. ↑ JONES, H K, MORRIS, B L, CHENEY, C S, BREWERTON, L J, MERRIN, P D, LEWIS, M A, MACDONALD, A M, COLEBY, L M, TALBOT, J C, MCKENZIE, A A, BIRD, M J, CUNNINGHAM, J, and ROBINSON, V K. 2000. The physical properties of minor aquifers in England and Wales. British Geological Survey Technical Report WD/00/4, Environment Agency R&D Publication 68. ↑ ENVIRONMENT AGENCY. 2012. Method statement for nitrate vulnerable zone review — Groundwaters Environment Agency report to Defra and Welsh Government – supporting paper for the Implementation of the Nitrates Directive 2013 – 2016.